In a quiet Palm Springs neighborhood. Great for families ,living room with fireplace, and big family room and large screen TV . Granite counters, tile floor and stainless steel appliances in the state of the art kitchen. King bed, LCD TV, private bath with large walk-in shower, tub with jets, in the Master bedroom. Large sitting room with queen sofa sleeper . Private back yard is facing the West for the best sun exposure. There is a pool spa, shaded patio area with propane BBQ. 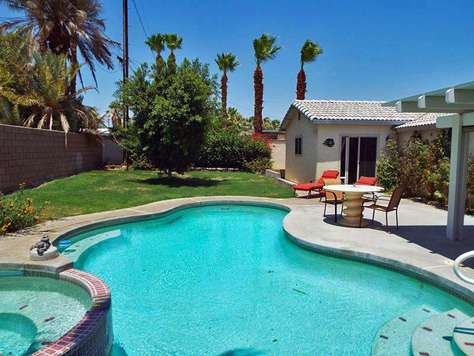 Close to golf, shopping, dining, horseback riding, bike path, and downtown Palm Springs. The other bedrooms have One Queen, One Queen and there is a Casita that has a King and private bath. WIFI and Propane BBQ are included.